Ganglia are common benign cystic lesions of the soft tissue. However, their occurrence in the intraosseous compartment is rare. These are uni/multiloculated benign cystic lesions located juxtaarticular and are filled with abundant mucoid material. Simple (unicameral) bone cyst, aneurysmal bone cysts (ABCs), Brodie's abscess, and giant cell tumor are the most common differentials of intraosseous ganglia (IG). These lesions have the potential to recur if inadequately treated. We highlight the clinical, radiologic, and morphological features as well as treatment and outcome of a case of unusually large distal tibial IG. A 60-year-old woman presented with history of pain in the distal aspect of right leg for 4 years associated with swelling and difficulty in walking. There was no preceding history of trauma. On examination, there was mild swelling and tenderness in that region. The range of motion at adjoining ankle joint was painful. There were no associated neurological deficits, fever, or constitutional symptoms. Plain radiographs and computed tomography scan demonstrated a well-defined lytic lesion (3.5 × 1.7cm) on the anterior aspect of the lower tibia. There was a fracture of the distal articular surface along with the presence of a calcaneal spur [Figure 1]a. Clinical possibilities of Brodie's abscess, tubercular abscess, and benign cyst were considered and the patient was investigated accordingly. Intraoperatively, a unilocutated cyst measuring 5.5 × 4 × 3 cm, filled with gelatinous material was seen having no direct communication with the ankle joint. The cavity was thoroughly currettaged, irrigated, and was then packed with bone grafts from the contralateral iliac crest. The specimen was sent to pathology laboratory for histopathology examination. Microscopically, the cyst had a flattened wall which comprised of fibrous tissue without synovial [Figure 1]b and [Figure 1]c. In addition, there was absence of inflammatory cells, granulomas, giant cells, osteoid, and frank malignant cells. Postoperatively, patient was discharged with slab below the knee and remains free of recurrence after 2 month follow-up. An IG cyst is an uncommon, benign cystic lesion of the bone occurring in close relationship to an articular surface. The femoral head and the proximal tibia are the most commonly affected sites. Most common presentation is limb pain and usually patients are middle aged. Examination findings reveal tenderness and slight swelling at the site of cyst or maybe normal. The features of pain, swelling, and tenderness were observed in our case. Most intraosseous ganglia are small, between 1 and 2 cm in maximum dimension; lesions over 5 cm are rare. In our case, size of lesion was larger than usual. Radiographs show a well-defined lytic lesion with surrounding zone of sclerosis. Presence of communication between the joint space and cyst has been reported by Menges et al. We were unable to demonstrate any communication intraoperatively or on radiographic studies. Microscopic examination of the IG is identical to its soft tissue counterpart. Histological differentials of IG include metastatic deposit from a mucinous adenocarcinoma, simple (unicameral) bone cyst, ABC, chondromyxoid fibroma, Brodie's abscess, and giant cell tumor. Simple (unicameral) bone cyst usually contain serous or serosanguinous material and cyst wall exhibits reactive bone formation. Absence of inflammatory cells, granulomas, giant cells, osteoid ruled out inflammatory, and primary bone tumors, while lack of large cells having high nucleocytoplasmic ratio, hyperchromasia, pleomorphism, and gland formation ruled out metastatic mucinous adenocarcinoma deposits. Hence, gross and histopathological examination aided in reaching this diagnosis as the possibility of intraosseous ganglion was not suspected clinically or radiologically. Though intraosseous ganglion is an uncommon lesion, it should be kept in the differential diagnosis of benign osteolytic lesions of distal tibia. Gross findings and histopathology are essential for its diagnosis. Sakamoto A, Oda Y, Iwamoto Y. Intraosseous Ganglia: A Series of 17 Treated Cases. BioMed Res Int 2013;4:18-21. Chatra PS. Bursae around the knee joints. Indian J Radiol Imaging 2012;22:27-30. Doğanavşargil B, Ayhan E, Argin M, Pehlivanoğlu B, Keçeci B, Sezak M, et al. 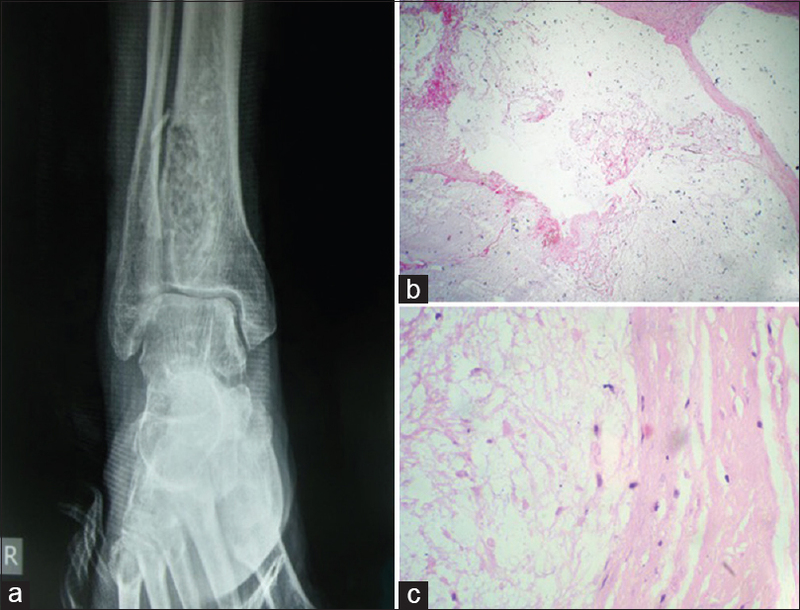 Cystic bone lesions: Histopathological spectrum and diagnostic challenges. Turk Patoloji Derg 2015;31:95-1034. Schajowicz F, ClavelSainz M, Slullitel JA. Juxta-articular bone cysts (intra-osseous ganglia): A clinicopathological study of eighty-eight cases. J Bone Joint Surg 1979;61:107-16. Menges V, Prager P, Cserhati MD, Becker W, Griss P, Wurster K. Intraosseous ganglion. Z Orthop Ihre Grenzeb 1977;115:67-5.